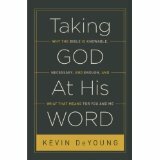 I’ve always appreciated Kevin DeYoung’s style of writing and his solid defense of the Word of God. The sub-title to this book is “Why the Bible is knowable, necessary, and enough, and what that means for you and me.” DeYoung gives the answer to this statement in eight chapters, followed by an appendix: “Thirty of the best books on the Good Book” in which he recommends, at various reading levels, other good books which defend and support the Word of God. DeYoung writes, “Scripture, because it is the breathed-out word of God, possesses the same authority as the God-man Jesus Christ. Submission to the Scriptures is submission to God. Rebellion against the Scriptures is rebellion against God. The Bible can no more fail, falter, or err, than God himself can fail, falter, or err.” In today’s culture, the believer may easily come in contact with those who question Christianity because they question whether the Bible is really God’s Word. DeYoung offers a great help in forming Biblical answers to such questions from the Scripture itself. The book is not long and can be read by layman and minister alike, and either will profit from the time spent.